Rounded gravel particles mostly toward the upper size range of granules (4-64 mm). 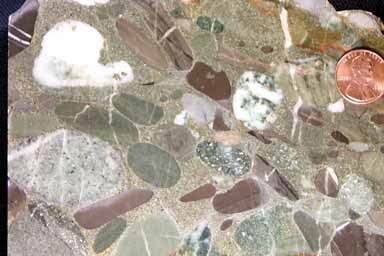 Lithic fragments include chert, meta-sedimentary rocks, milky (metamorphic) quartz, and occasional igneous rocks and micrite limestones. The matrix (material filling the spaces between the granules) is mostly sand, silt, and clay. This rock is extremely immature, being low in quartz, high in gravel, poor in sphericity, and poorly sorted. The gravel fragments tend to be elongated, but do not show a preferred orientation (i.e. are not imbricated), indicating they were probably deposited during mass transport (e.g. debris flow such as a landslide or underwater avalanche).